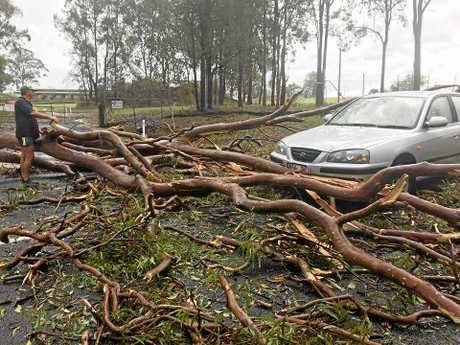 MORE than 5000 people in the Gympie region were left without power after a monstrous storm, including a tornado, bore down on the region yesterday afternoon. Trees blocked roads, power lines fell, roofs caved in and cars were smashed as destructive winds, large hailstones and heavy rain moved in at great speed and assaulted the wider region for hours on end. Queensland Fire and Emergency Services said they had received over 100 job calls in the hour after the first wave of the storm, with 50 of those in concentrated to Gympie. Storm damage from around the region on October 11, 2018. A QFES spokeswoman said most of the calls had related to fallen trees and roof damage, and that Gympie had been the worst hit by the initial wave. According to the Energex website, 5274 of the 5584 total houses affected in southeast Queensland were reported in the Gympie Regional Council area as of 5.30pm. Gympie had 1398 customers affected, followed by 749 at Southside, 436 at Pie Creek and 394 at Veteran. An Energex spokeswoman said Gympie had been hit by nearly 30,000 lightning strikes as at approximately 3pm, which combined with a similar number on the Sunshine Coast to make approximately 60,000 in total by mid-afternoon. She said the 73 combined Coast and Gympie Energex crews had been dispatched to restore power in damaged areas and would work rolling shifts to attend to all customers in need. Forty-three power lines were reported to be down in the Gympie council area and residents were warned to keep out of danger. "We advise that all fallen power lines should be treated as live," she said. "Call 13 19 62 to report any fallen power lines you see, or for electric shocks." A spokesman later advised residents to stay patient as crews worked in "difficult" conditions to restore power. "These repairs will take a fair bit of time, I think all residents can understand this has been a pretty big weather event," he said. 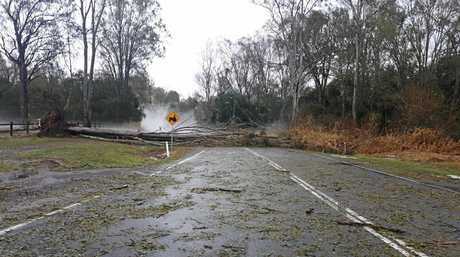 Large trees were reported as downed all over the region, blocking roads and creating traffic delays. One lucky driver reportedly escaped serious injury when a tree fell and landed on his car on Eel Creek and Rocks Rds at Pie Creek around 2.30pm. Both lanes near Kidd Bridge were briefly closed after a two-car crash that occurred during the first wave of the storm. Shoppers were forced to evacuate the Woolworths Cooloola Cove store as water poured through the ceiling. Gympie Regional Realty were inundated with calls from rental properties reporting roof damage, with one employee saying they had fielded "too many calls to count". "We've had at least 40 houses reported with broken windows and other damages," she said. "We're still in the process of working everything out at the moment, we'll be working hard to get help to everyone as soon as possible." By 5.19pm, the Bureau of Meteorology reported severe thunderstorm warnings localised to southeast Queensland had eased. "While the immediate threat of severe thunderstorms across southeast Queensland has passed, a more general Severe Thunderstorm Warning remains current for the Southern Burnett, southern Central Highlands and Darling Downs," the update said. "The situation will continue to be monitored and further, more detailed Severe Thunderstorm Warnings will be issued as necessary." A tornado was reported at Tansey around 3.12pm, along with tennis-ball sized hail (up to 7cm) at Kumbia, 4-5cm between Proston and Murgon, 3 to 5cm hail at and near Gympie and vast property and vegetation damage across all affected towns.